You can apply watermark text to printers individually. Print scripting makes it possible to change watermarks dynamically (see Advanced scripting (print scripting)). Watermarks can contain substitution variables allowing the insertion of document metadata such as date/time, username, document name, etc. A typical watermark is shown in the picture immediately below. This watermark uses the %user%, %date% and %signature% substitution variables described in the Substitution Variables section. PCL6 and PostScript drivers are recommended for devices that support these drivers, as they provide better quality and consistent prints with watermarks. Owner Identification. Add the username to each page so it is easy to find the owner (e.g. uncollected print jobs). Student Assignments. Add the username and time of printing to each page. This helps teachers match up student work and help students prove that assignments were delivered on time. Tracking an Organization's Physical Documents. Add a sequentially allocated number to every document printed. This number is a document-level Bates number (http://en.wikipedia.org/wiki/Bates_numbering). It is recorded in the PaperCut NG/MF database and is useful for organizing document trails. Identification and Source Tracking. Add a unique and secure digital signature to each document. Use this to verify the origin and generation details of a document. (Note: see Digital Signatures in Detail section below if security is required). Content ownership and copyright. Add a repeated pattern stating the copyright notice or company name across the entire page to protect valuable documents where royalties apply. .
Behavioral Change. The cost of each print job is added to the bottom of each page. This gives the user immediate feedback on the cost of their printing. To configure watermarking based on the user (e.g. a user's group membership) or job attributes, consider the Advanced Scripting feature. Advanced Scripting allows the watermarking to be enabled/disabled and the watermarking text to be adjusted to meet any need. See Advanced scripting (print scripting) for more details. Watermarking is currently available for printers using PostScript and PCL drivers. You should ensure that the printer driverA printer driver or a print processor is a piece of software that converts the data to be printed to the form specific to a printer. The purpose of printer drivers is to allow applications to do printing without being aware of the technical details of each printer model. uses the PostScript or PCL language rather than GDI or other languages. You can verify this by observing the word PostScript, PCL5 or PCL6 in the Job Log as shown in the screenshot below. On Windows systems, if the language lists as EMF, then turn off Advanced Printing Features as described in Troubleshooting. 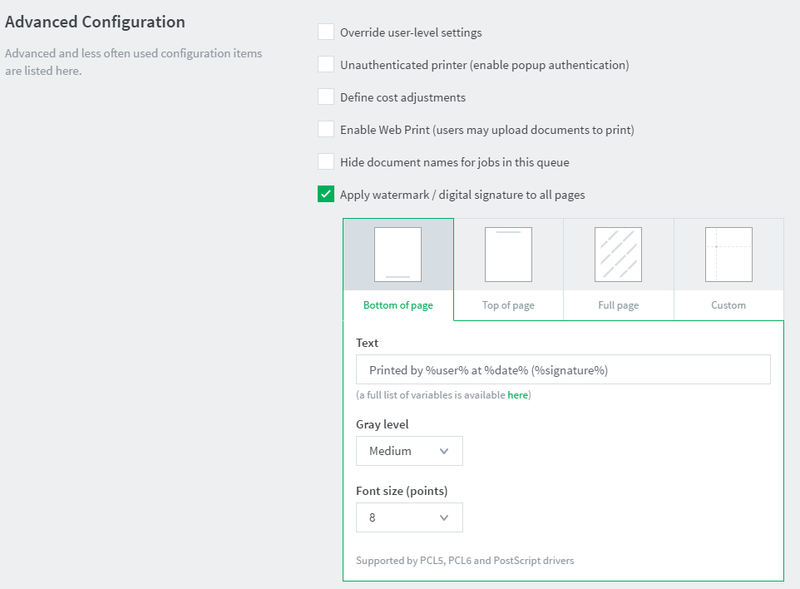 In the Advanced Configuration area, select the Apply watermark / digital signature to all pages check box. In Text, enter the text to be printed in the watermark. You can use macro substitution variables, such as %user% and %date%. For a complete list of the variables, see Substitution variables/macros. In Position, select the location on the page where you want watermark to be displayed. This can be Bottom of page, Top of page, Full page, or Custom. Custom is intended for advanced situations where some tweaking is required due to differences in the page printable area. Custom positions are specified as the distance, in millimeters, from the top or bottom of the page (Longitude), and from the left or right of the page (Latitude). Gray level—determines how dark or light the text will be. Medium is the default. Light is just viewable. Font size (points)—determines the watermark text size. you cannot select any options. By default, the watermark will print in 14pt with Medium gray scale. Only PCL6 and postscript drivers are supported. %user% The name (username) of the user that printed the document. %user_primary_card_id% The user's primary ID code. %user_secondary_card_id% The user's secondary ID code. %user_full_name% The full name of the user that printed the document. %user_email% The email address of the user that printed the document. %date% The date/time that the document was printed. The date is formatted in according the locale of the server. An example of a %date% is 12/12/2010 3:12:37 PM. %document% The name of the document that printed. %server% The server name that is hosting the printer that printed the print job. %printer% The name of the printer where the print job was printed. %client_ip% The IP address of the workstation the job was sent from. %client_machine% The name of the workstation that sent the print job. %job_id% The PaperCut NG/MF job id of the job. %copies% The number of copies of the document that was printed. %cost% The cost of the print job. %pages% The total number of pages in the print job. %bates% A sequentially incrementing number based on a Bates Numbering (http://en.wikipedia.org/wiki/Bates_numbering) scheme. All pages in the document are stamped with the same number. The number is recorded as a signature in the print log. %signature% A unique secure digital signature (in text form) generated via an MD5 HMAC. The signature is recorded in the print log. See Digital Signatures in Detail (Advanced) below for technical details. %digest% A unique digital signature (in text form) generated using an MD5 of various document attributes. %sig_sha1% Same as %signature% but based on the SHA1 message digest algorithm. %digest_sha1% Same as %digest% but based on the SHA1 message digest algorithm. MD5— MD5 is secure enough for print job signature applications. Because the signatures are shorter, using MD5 makes it easier to enter keys to find matching print jobs. SHA1—provided as an option for cryptographic completeness. key is a random string generated on first use and stored in the config keyA config key stores information about a specific advanced setting in PaperCut. Config keys are editable by an administrator in the Config Editor. "print.signature.hmac-key" and hash is either MD5 or SHA1. date time is formatted in ISO 8601 basic format from year to second ("yyyyMMddTHHmmss"). The time is local time (not UTC). E.g. "20100130T141059"
The Job Log page is displayed. Click edit next to Filter on. In Signature, enter the signature. Click Apply Filter. The matching job should list. 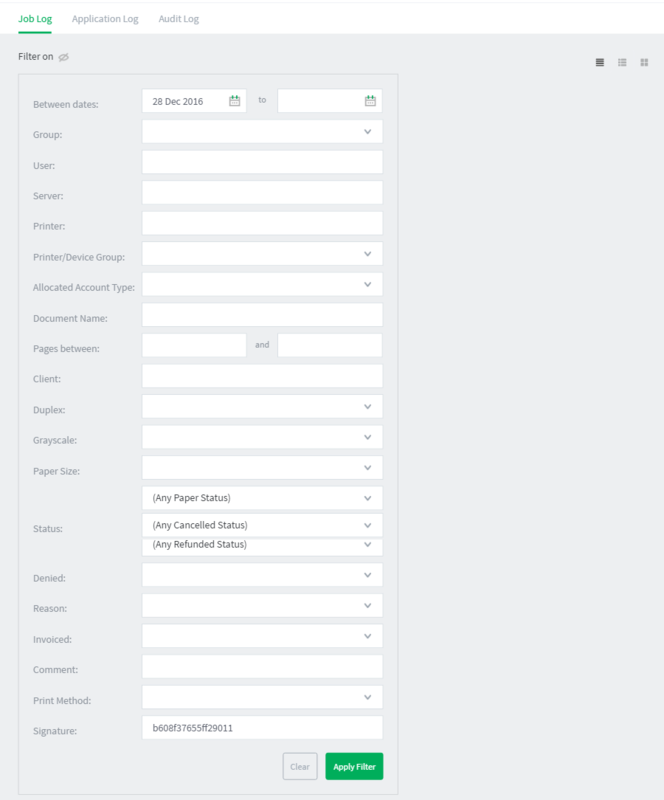 For example, the following screenshot shows how to search for the print job with signature b608c7a39f08643768051217f2f5315a in the job logThe job log retains a history of all print jobs including the following details: the user who printed (ie. their network user ID), the time of the print event, the number of pages, document attributes such as color, duplex, grayscale, paper size, document area, paper length, where the print job originated from (the workstation name or IP address), and the document name and type (for example, a Word document’s file name)..
Watermarking requires print jobs to be printed in PostScript or PCL format. If your document is printed in EMF you might be able to print in PostScript or PCL by following the procedure listed in the EMF section below. For all other drivers, see Other Printer Languages. On Windows systems, if the printer language for a job lists as EMF, then turn off Advanced Printing Features. Disabling this option causes print jobs to be rendered into their printer language on the client side. Enabling it can result in rendering on the server side, which is usually unwanted. On the print server, select Start > Control Panel > Printers > [right-click printer] > Properties > Advanced. Turn off (disable) the Enable advanced printing features option. Test printing and check the printer language to ensure that it is now PostScript or PCL. You can read more about this setting on the Microsoft website at: http://support.microsoft.com/?kbid=268093. If the printer language for a job is listed as a non-supported language, such as ESC/P2(Epson), then watermarking does not work. The manufacturer might also support other languages, such as PostScript. Check the printer manufacturer's website download page for details. When updating printer drivers, it is important to update the printer drivers on both the client and the server.